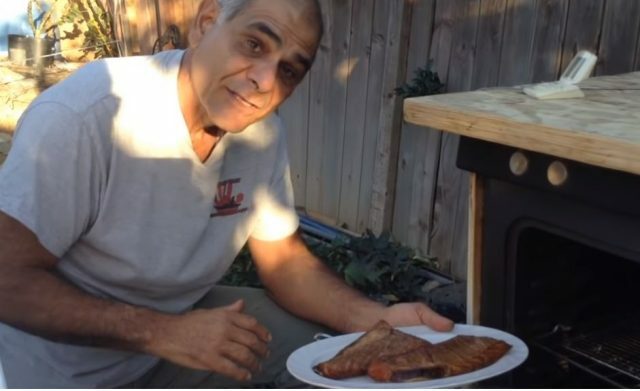 I just can’t believe how popular smoking tuna and tuna belly is among SoCal fishermen. Frankly, it’s easy to understand. We’re catching tons of nice grade tuna. And with modern technology, and affordable smokers, fishermen can smoke anything—especially tuna. My email box has been filled lately with smoking tuna questions. For example, how do I deal with a 4-inch thick tuna belly? What’s the difference between dry brine from wet? How do I smoke skipjack? Those questions, plus, our Facebook page is going crazy over smoked tuna inspired me to create this recipe. So here’s my version of an easy-to-do, smoked tuna belly recipe. This recipe can be used for straight tuna fillets as well. In this video I talk about the difference between a wet and dry brine. And then the development of the pellicle skin. You’ll learn tips and tricks for keeping an eye on the most important perimeters throughout the entire process. All you need is some fresh tuna and a good reliable smoker along with this tasty recipe for great smoked tuna and/or smoked tuna belly. Start by adding the soy sauce, white and brown sugar, and finally the hot sauce into a gallon of water. Mix throughly. Immerse the fillets into the brine. Please note, if your fillets are thawed, you must add 4 cups of ice cubes into the brine. Place a small plate on top of the immersed fillets to keep them under the brine during the brining. Brine for 8-10 hours, or overnight. Rinse the fillets and then pat them dry. Place on a rack with a small fan positioned one foot away. 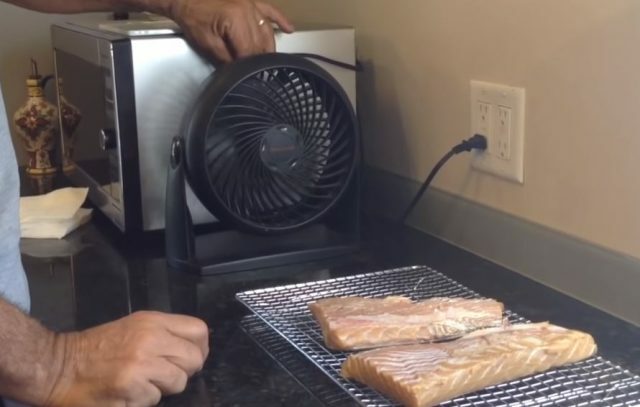 Allow the fan to dry the fillets for at least 2 hours. This allows the formation of a dry skin to form around the fillets. The skin is referred to as the pellicle skin. This skin absorbs the smoke flavors generated by your smoker. Don’t skip this step! Set your smoker between 220-230F. You need to achieve an internal temperature of 130-150F in the thickest part of your fillet. And, depending on the size and thickness of your fillets, this can take anywhere from 1-3 hours. Start checking the internal temperature after one hour of smoking to get a feel of how much time still is required.